The recognition is part of the 2016 Stevie Awards for Great Employers. 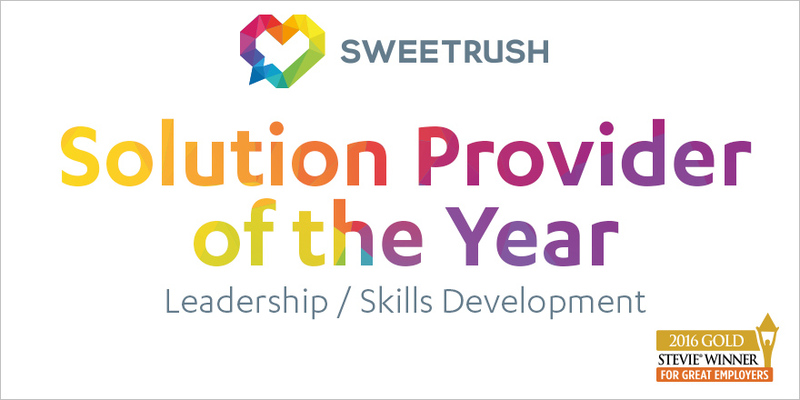 San Francisco, Calif., October 3, 2016 – SweetRush has earned a Gold recognition in the category of “Leadership or Skills Development Solution Provider of the Year” as part of the 2016 Stevie® Awards for Great Employers. SweetRush was recognized for its “world-class client list and growing reputation for exceeding client requirements,” as one of the judges stated in the evaluation comments. The Stevie Awards for Great Employers recognize the world’s best employers and the human resources professionals, teams, achievements, and HR-related products and suppliers who help to create and drive great places to work. More than 250 nominations from organizations around the world were submitted this year for consideration. “When leadership and skills development learning solutions are successfully executed, we can dramatically impact individuals’ performance, careers, and even their lives. Great employers, including the clients we work with, know this, and that’s why we’re so proud to be in the company of the organizations, professionals, and solution providers recognized by the Stevie Awards,” said Arturo Schwartzberg, Co-Founder and Chairman of SweetRush, Inc.
Find details here about the Stevie Awards for Great Employers and the list of 2016 Stevie winners. Stevie Awards are conferred in seven programs: the Asia-Pacific Stevie Awards, the German Stevie Awards, The American Business Awards, The International Business Awards, the Stevie Awards for Women in Business, the Stevie Awards for Great Employers and the Stevie Awards for Sales & Customer Service. Stevie Awards competitions receive more than 10,000 entries each year from organizations in more than 60 nations. Honoring organizations of all types and sizes and the people behind them, the Stevies recognize outstanding performances in the workplace worldwide. Learn more about the Stevie Awards.